* Patch Test Required - All of the below treatments require a 48 hour patch test if you have not have the treatment carried out by Pamper Room before or within the last 6 months. We apply one single synthetic lash to one of your own natural lashes, by using this method you will maintain healthy lash growth. The synthetic lashes shed with your own natural lash loss. We recommend regular infill maintenance every 2-3 weeks following your initial application. Please note that our 30 minute touch-up appointments are not recommended as regular infill appointments but are available if you need a few more lashes added between infill appointments for a night out/special occassion. Pamper Room's Owner, Angela is our Senior Lash Technician with more than 5 years experience, our Lash Technician has over 2 years experience. Please visit our Treatment Preparation & After Care advise for more information on our eyelash extension treatments, link at the bottom of this page! A revolutionary advanced lashing technique where a hand created fan of between 2 to 6 ultra-fine synthetic eyelashes are applied to one single natural eyelash, creating fluffier looking lashes with visibly more volume than classic lashes. We recommend regular maintenance every 3-4 weeks following your initial application. Please note that the Maintenance infill price is only valid within 4 weeks of the full set being applied. We will only infill lashes that have been applied in our salon. 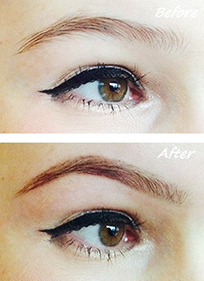 An ideal treatment if you want a quick & temporary lash extension! Cluster lashes are as the name suggests, a v-shaped cluster of lashes, which are bound together at the base. We use bulb-less clusters for a more natural look. (Please do not confuse these with Russian volume lashes, which are a hand-made fan of ultra-fine light weight lashes). Cluster are placed directly onto your own natural lashes with a sensitive glue, no isolation takes place which is why these lashes must be removed within 2 weeks of application to prevent damaging your own natural lashes... we are so concerned with the health of your natural lashes that we offer a FREE removal of these extensions, this must be booked at the same time that you book your application appointment. A lash lift is the safe and easy way to temporarily curl (or straighten) lashes. 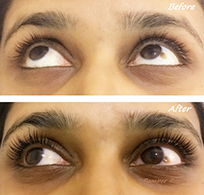 Elleebana Lash Lift & Curl offers an ultra-hydrating keratin treatment option that you will love. Even our clients with the darkest of lashes still have light lash tips so a Lash Lift, Curl & Tint is a fantastic option for everyone who is interested in dark, luscious, and beautifully curled lashes with low-maintence and minimal commitment. We use a silicone rod which come in different sizes to accommodate different lash lengths and apply a special formula to lift and curl your natural lashes. You will need to wait 6-8 weeks before the process can be repeated. Introducing our new brand Belmacil to provide both result consistency and the highest quality. An eyebrow tint will give your brows the depth and presence to enhance your eyes and eyelash tinting will give the illusion of fuller longer lashes and is perfect if you don’t want to wear mascara, even dark lashes have lighter tips! Lashes take 10 minutes to apply, brows just 5 minutes and the results can last up to 6 weeks. Belmacil Lash Tinting is the perfect companion to our Elleebana Lash Lift & Curl treatment. A brow-shaping treatment made up of 7 specially designed steps, we shall begin with a consultation so together we are clear about what’s going to be achieved. We will then proceed with the other steps consisting of tinting, waxing and threading that will give you well-groomed and defined eyebrows. Most clients will need to under-go a course of treatments until the desired look is achieved, this may consist of 4-8 treatments, 3-4 weeks apart. Once the desired look is achieved future appointments will consist of tinting and hair removal only.